Country House Locanda Solomeo offers a luxurious atmosphere comparable to most hotels in Perugia while offering the peace and quiet of the countryside. Locanda Solomeo invites you to spend an unforgettable holiday in exclusive surroundings, wrapped in a warm and intimate atmosphere, which compliments the peace and tranquillity of the village and the cordiality of its inhabitants. There are twelve bedrooms, each with breathtaking views. The restaurant, open also to non-residents, offers tasty typical Umbrian and Italian dishes, prepared with natural ingredients grown on our own farm. The Fountain Room is well-equipped with some of the most up to date audio-visual technology and can host meetings for up to 50 people. The house has comfortable lounge where you can enjoy conversation and relax in comfort. From the airport follow the green sign FIRENZE A1 (Highway) for about 40 km. Once you reach the entrance of the A1 Highway take the direction FIRENZE. Get out after about 50 km. at ORTE exit and take the motorway E45 direction PERUGIA and drive for about 80 km. A few kilometres before Perugia, after BALANZANO exit, you have to get out from E45 motorway and follow the direction PERUGIA/FIRENZE. Pass Perugia (without getting out from the motorway) and continue for other 10 Km. and get out at CORCIANO exit. Turn right, after 400 m. turn right again and follow the direction SOLOMEO for other 4 km. until you reach the village. 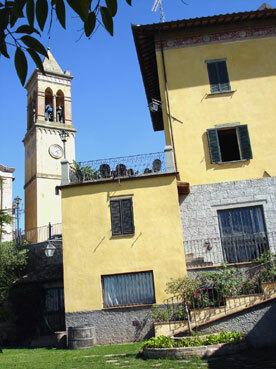 Stop at Locanda Solomeo for check-in, located in the square of Solomeo village in front of the church. From Florence you have to take the highway A1 direction ROME and get out at VALDICHIANA exit. Then turn right and follow the direction PERUGIA, and get out at CORCIANO exit. Follow instructions above. On the E45 always follow the direction ROME for about 150 km. When you arrive in PONTE SAN GIOVANNI follow the direction PERUGIA - FIRENZE and leave the E45. Pass 4 tunnels and after the last one continue for other 6 km. and get out at CORCIANO exit. Follow instructions above. From the airport you have to get the statal road SS76 and follow the directions to Jesi, Fabriano, Fossato di Vico. Once you arrive in Fossato di Vico follow the direction towards Valfabbrica, Casa Castalda. From Valfabbrica follow the directions Perugia (E45). A few kilometers after Valfabbrica the road will be 4 lanes. Approaching Perugia, when you arrive in PONTE SAN GIOVANNI follow the direction PERUGIA - FIRENZE and leave the E45. Pass 4 tunnels and after the last one continue for other 6 km. Get out at CORCIANO exit. Follow instructions above.